If you’ve been reading the blog for a while, it’s no secret that I have a sweet tooth that just won’t quit! I love summer because there’s so much produce growing naturally that is sweet! I love peaches, apples, grapes, oranges and most of all I love strawberries. Since summer is the perfect time for strawberries, I find myself buying huge containers of them and using them in pretty much anything and everything my heart desires! 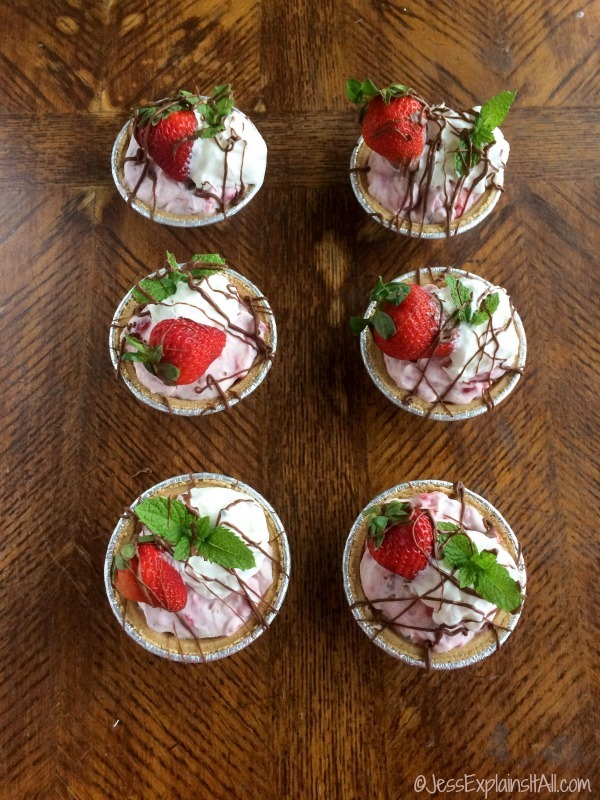 The latest recipe that I created using strawberries is this super simple recipe for these mini No Bake Chocolate Covered Strawberry Pies. Strawberries? Check. Chocolate? Check. A little bit of indulgence? Yeahhhhhh you’ve got me there! Difficult to recreate? No – guys this is soooooooo easy. Time consuming? Are you kidding – it took me like 5 minutes to make! The best part? No one will know how easy it was because it taste like a 5-star summer dessert! Once I decided on this effortless recipe I headed out to Walmart to pick up all my ingredients. 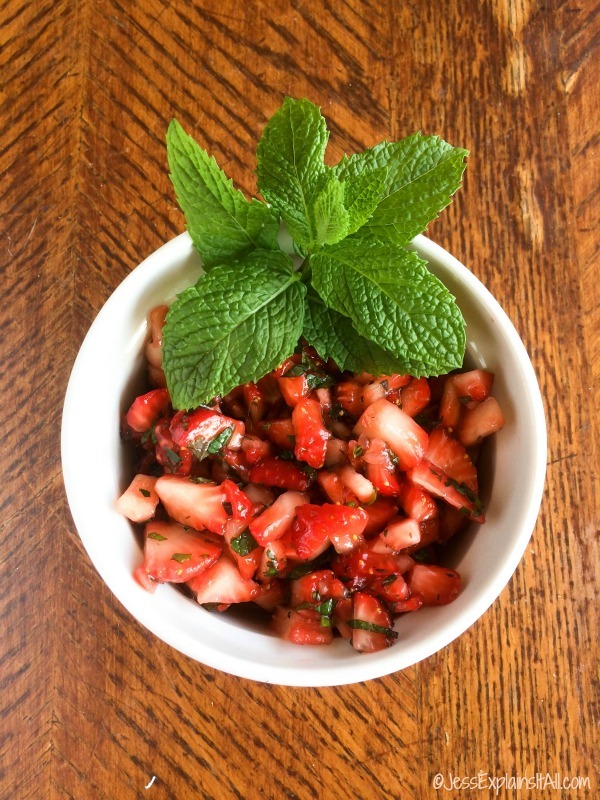 First, chop your mint and strawberries finely and combine with the brown sugar in a bowl. Set this aside for a couple of minutes, until the sugar starts to pull the juices from the strawberries. 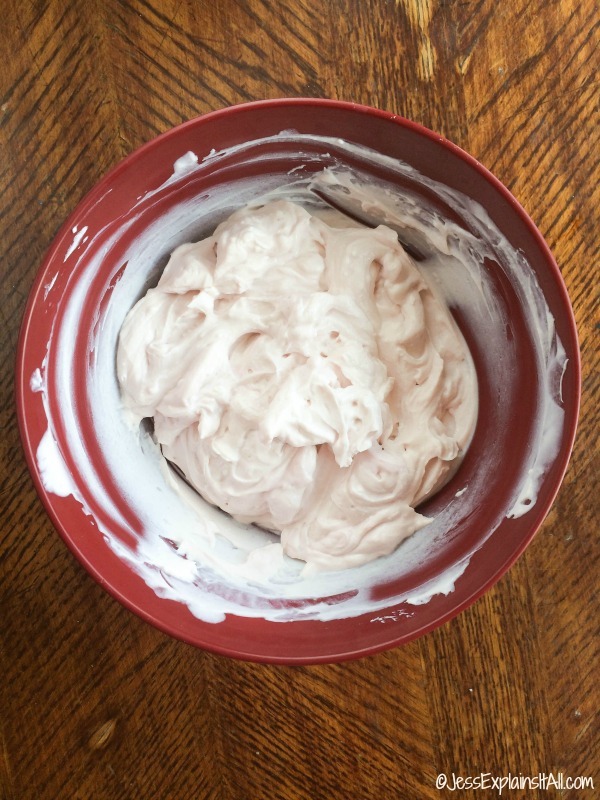 In another bowl, add the two containers of Dannon® Light & Fit® Strawberry Cheesecake Greek Yogurt and the cream cheese. Mix until well combined and not lumpy. I don’t have a mixer, because there’s still a few items I’m missing from my adult kitchen… but I went to town on this with a fork and it worked pretty well. Note: using a whisk is more trouble than it’s worth. I promise. 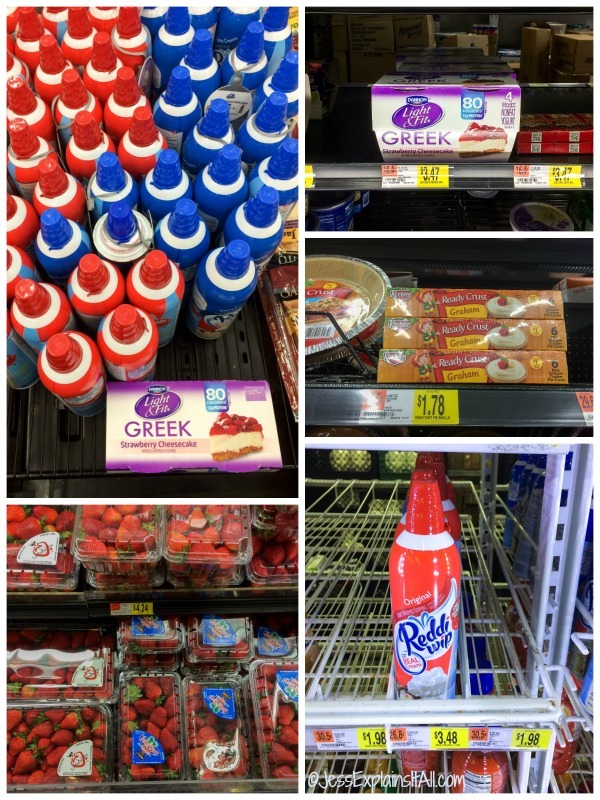 Combine the strawberry mixture with the Dannon® Light & Fit® Strawberry Cheesecake Greek Yogurt and cream cheese mixture making sure to use all of the juice that was pulled from the strawberries. 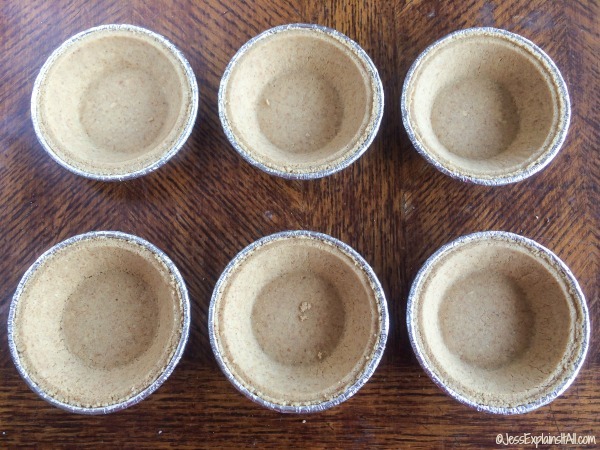 Unwrap your package of Keebler® Ready Crust® Mini Graham Cracker Pie Crusts and lay them on the counter. Now spoon the mixture into them until they are full. I filled them and tapped them gently on the counter to make sure there were no bubbles in the mixture and that it was settled. Note: you will have a little bit of extra mixture…but I’m sure you can find a good way to use that. ? Now here is where you have a few options – you can either make these ahead of time, or you can make them right as you’re ready to use them. If you’re going to prepare them ahead of time for a pool party, or a summer BBQ, stick you can stick them in the freezer and pull them out a couple of hours before you’re ready to use them. 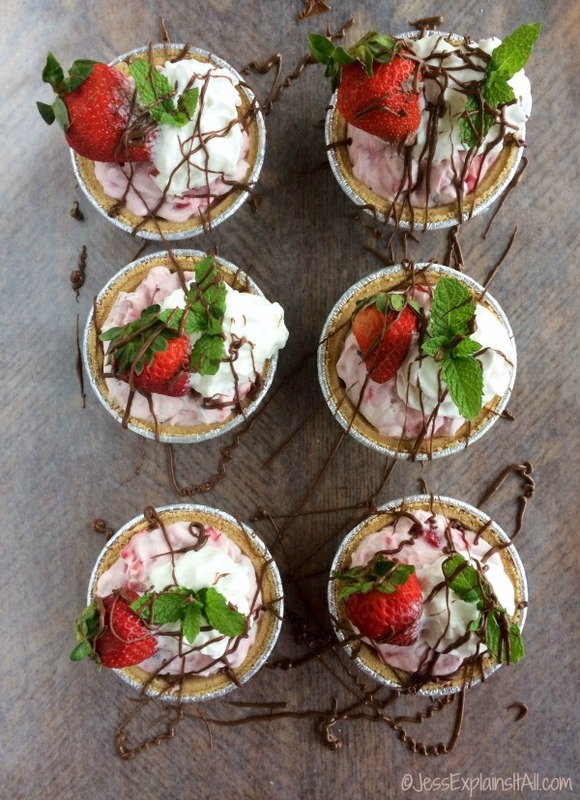 If you’re ready to use them now, garnish them with Reddi-wip®, a small strawberry (these are mini-pies after all!) and a sprig of mint. Then melt your chocolate chips (I put them in the microwave for about a minute) and drizzle on top. I did this over wax paper so I wouldn’t make a mess. And that’s it. You’re done! They’re… dare I say it? Easy as pie. ? And if you’re really curious about what these pies taste like straight from the freezer because your sweet tooth won’t quit, they’re actually quite nice. They have a “shaved-ice” kind of texture, which I like. I do prefer them not frozen though. But to each their own. Let me know what way you like them! 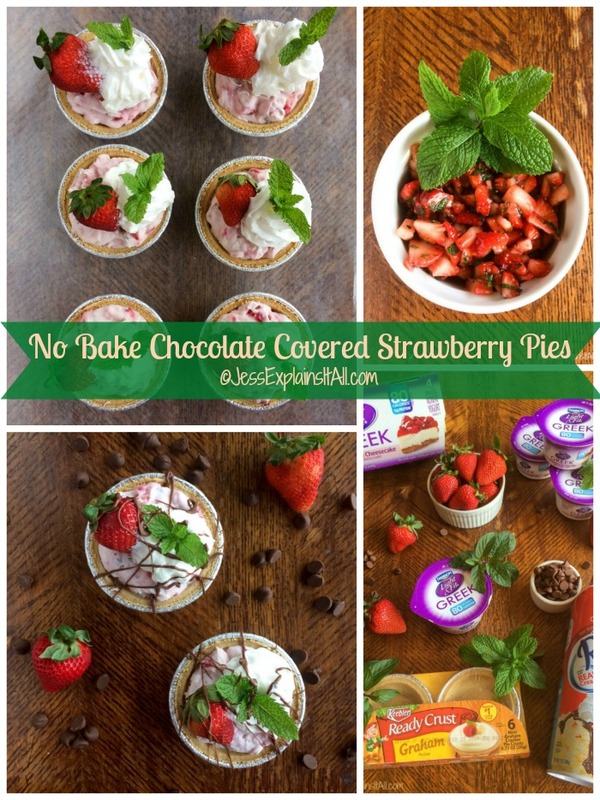 I love these no bake chocolate covered strawberry pies because they are sweet, quick and delicious. PLUS as far as desserts go, these are a really healthy option! 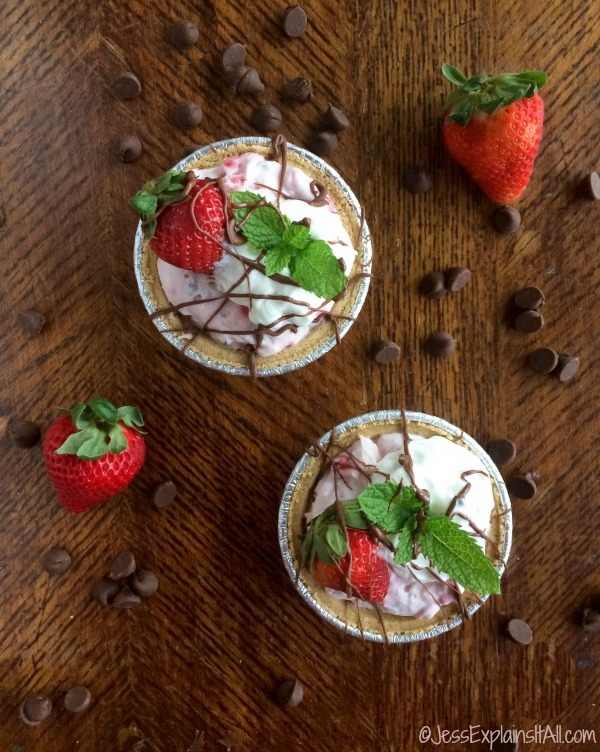 The Dannon® Light & Fit® Strawberry Cheesecake Greek Yogurt is low in calories, so you’re not splurging there, and I used 1/3 less fat cream cheese saving additional calories! 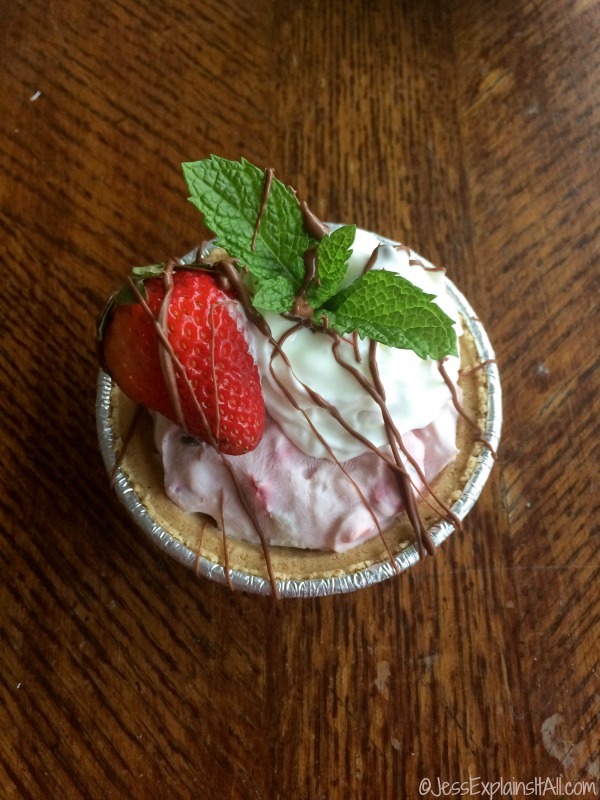 The flavors of the strawberries and mint are so sweet that you only need just a little bit of extra sugar to make a really flavorful and light dessert. 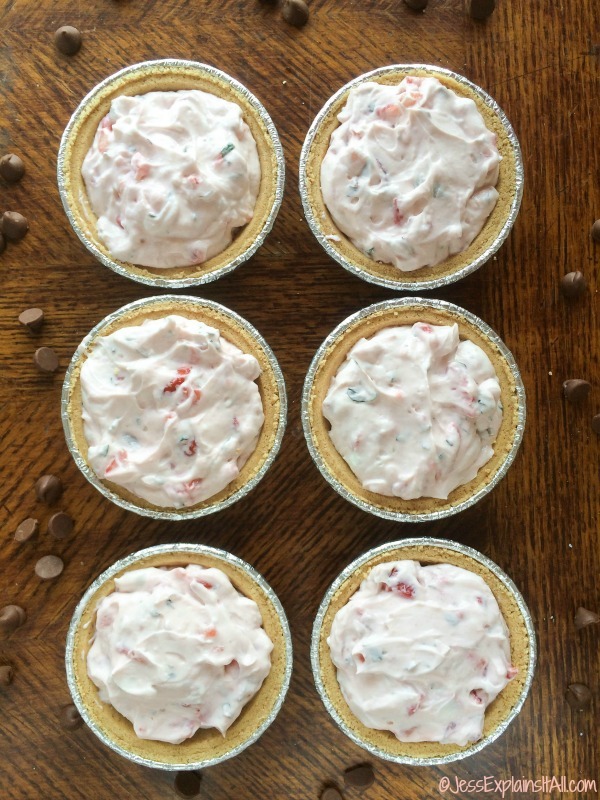 Now, if you’ll excuse me, I’m going to go outside and eat one of my mini no bake chocolate covered strawberry pies next to the pool. Until next time! 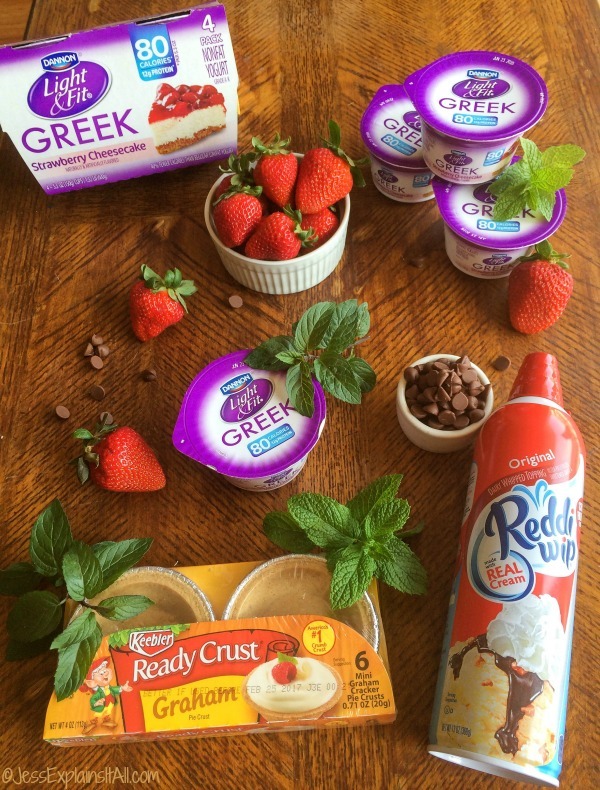 In another bowl, add the two containers of Dannon® Light & Fit® Strawberry Cheesecake Greek Yogurt and the cream cheese. Mix until well combined and not lumpy. Take your package of Keebler® Ready Crust® Mini Graham Cracker Pie Crusts and spoon the mixture into them until they are full. I filled them and tapped them gently on the counter to make sure there were no bubbles in the mixture and that it was settled. Now here is where you have a few options - you can either make these ahead of time, or you can make them right as you're ready to use them. If you're going to prepare them ahead of time for a pool party, or a summer BBQ, stick you can stick them in the freezer and pull them out a couple of hours before you're ready to use them. 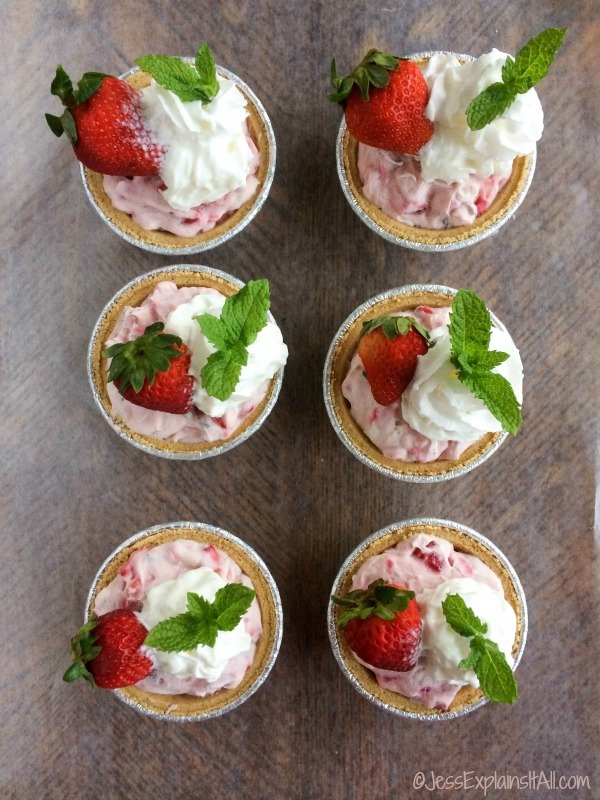 If you're ready to use them now, garnish them with Reddi-wip®, a small strawberry (these are mini-pies after all!) and a sprig of mint. Then melt your chocolate chips (I put them in the microwave for about a minute) and drizzle on top. 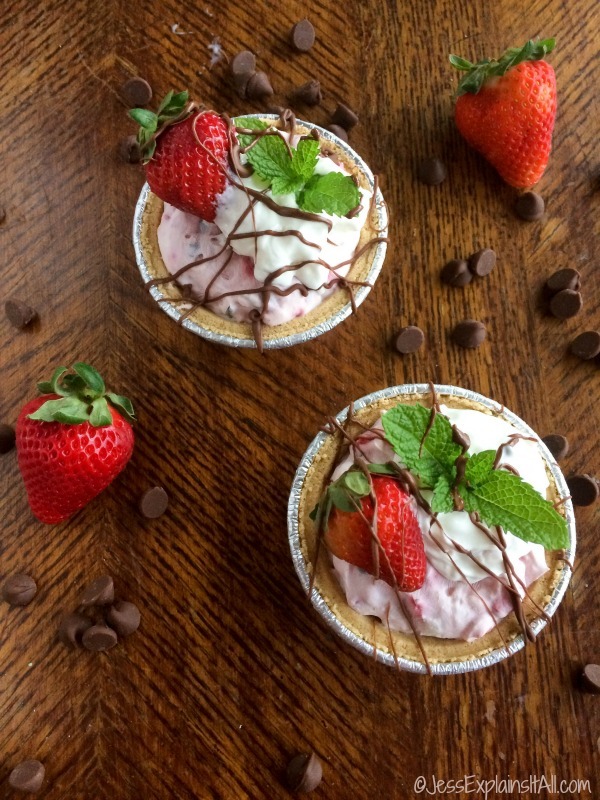 If you liked these no bake chocolate covered strawberry pies, check out more effortless mini-pies here, and make sure to get your Ibotta rebate here. Looking for a another delicious chocolatey dessert? 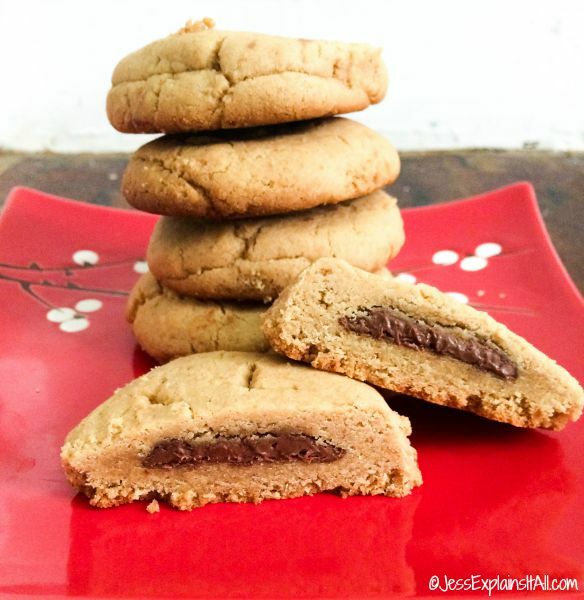 Check out my recipe for Nutella Stuffed Peanut Butter Cookies! OMG this look delicious, definitely will have to try this at home. 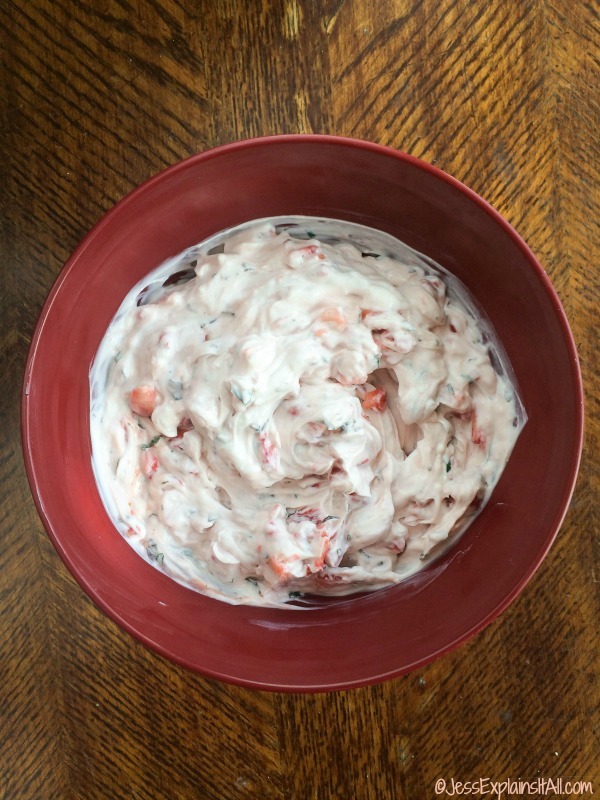 The best thing about it is that you can literally make this recipe in 5 minutes and NO ONE will know how easy it is because it tastes divine! I’m going to start making these for when I have people over for coffee/tea dates! Yay! Nothing better than a relaxing weekend with something sweet to eat. Let me know what you think if you try them! 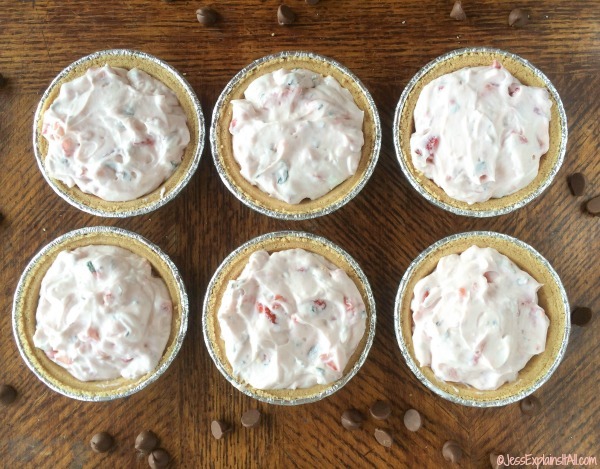 These no bake pies look soooo good, I must try them this weekend!!! Glad you like the look of them Tamara! Let me know what you think if you try them! !